Let the staff focus on the things that matter the most with an automated Self Check-in System. Give your staff more time to answer the needs and give the guest a quick, easy and mobile check-in process. By eliminating the traditional stop at the front desk, staff can switch their focus to face-to-face services that are more valuable than handing out a registration card and a key. Quick and easy check-in process. Automated from start to finish. Guests can login on any desktop or mobile device to update booking details and payment methods, eSign documents, complete check-in and get room entry instructions via email and SMS Message. FulI integration with MyPMS insures “real-time” status updates to booking and payment details, credit card authorizations and Digital Signatures. 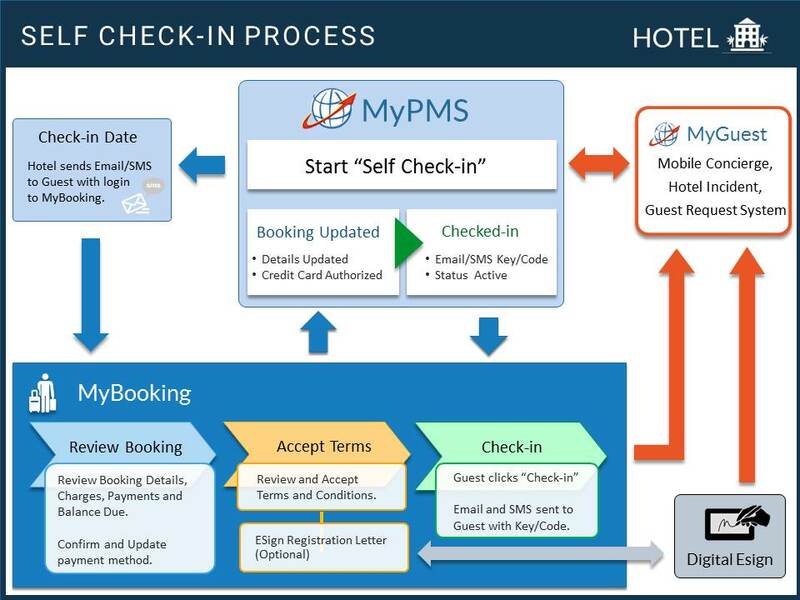 Self Check-in can be enabled for any MyPMS customer and integrated with the MyGuest Guest Request System. 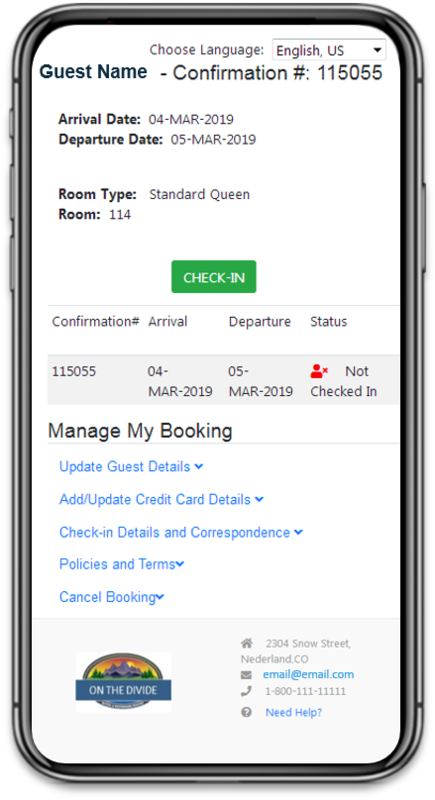 Managers and key staff receive immediate alerts and notifications when a guest checks-in or needs assistance with our Manager’s App (IOS or Android) using the MyGuest Guest Request System. We support two Self Check-in System options: Mobile Self Check-in using any guest mobile device and, Kiosk Self Check-in with a designated mobile check-in area at the Front Desk. Learn how the Self Check-in process works. All software solution - from booking creation to check-in. Ease-of-deployment and 24 x 7 support. The Self Check-in system is completely automated from start to finish and includes automatic email messaging, SMS Messaging, payment authorizations, eSign – Digital Document Signing and room specific information allowing detailed instructions for a mix of hotel and rental units. Both of these options use MyBooking, the BookingCenter secure access guest portal, to update booking details, authorize payments, accept terms and check-in. It is fully integrated with MyPMS for “real-time” booking and status updates. MyBooking is custom branded to give a personalized guest experience ‘with a “Call for Help” button to message staff via Skype, WhatsApp, FaceTime when a guest needs help or has questions. Managers and key staff can receive immediate alerts and notifications when guests check-in, need assistance or submit a request,using our optional MyGuest Manager’s App. If you need a signed Registration Letter with terms and conditions, we offer an optional digital signing service, eSign, which is seamlessly integrated into the Self Check-in process. Adding the SMS Module to Self CheckIn delivers immediacy to your Guests. BookingCenter supports two Self Check-in System Options. Mobile Check-In lets Guests bypass the Front Desk and go straight to their room and, the Kiosk option can be used to supplement the Front Desk check-in process. The tablets and template-based design makes the system inexpensive, flexible, (iOS or Android) and scalable. Self Check-in comes with 24 x 7 Support and all Upgrades to the service. All BookingCenter customers receive 24 x 7 technical support and updates to the interface. Our team will get your property up and running with Self Check-in no time! Get updates and communicate with guests. With the MyGuest Manager App, get immediate alerts and notifications when guests check-in, digitally signs a document, needs assistance or submits a request. Our Downloadable iOS app let’s key staff receive immediate alerts via ‘push’ notifications and monitor requests in real-time from anywhere via a smart phone. 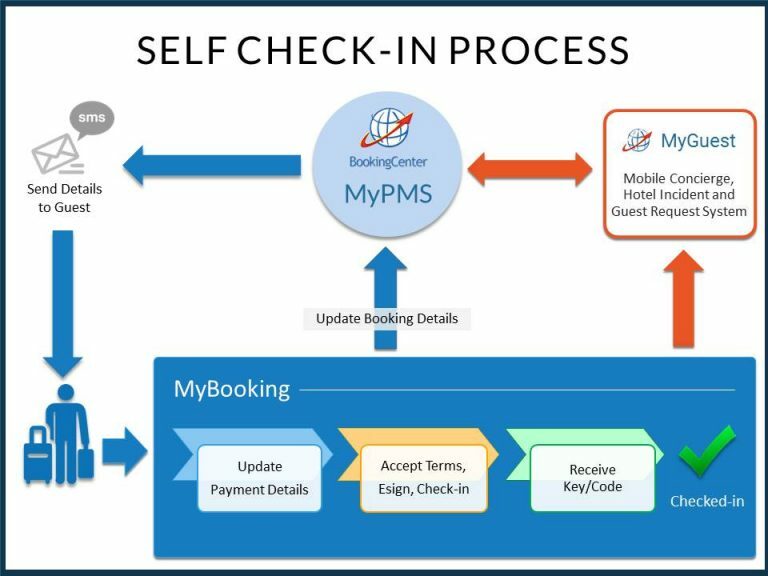 Customers of BookingCenter’s MyPMS can add either of the Self CheckIn options to their existing installations. Both come with complete setup and training, which includes customized setup of the necessary Self CheckIn screens and integration with your confirmation and registration process. Mobile Self Check-in is a ideal for properties who want guests to bypass the front desk completely by checking-in on their mobile device and going straight to their room. 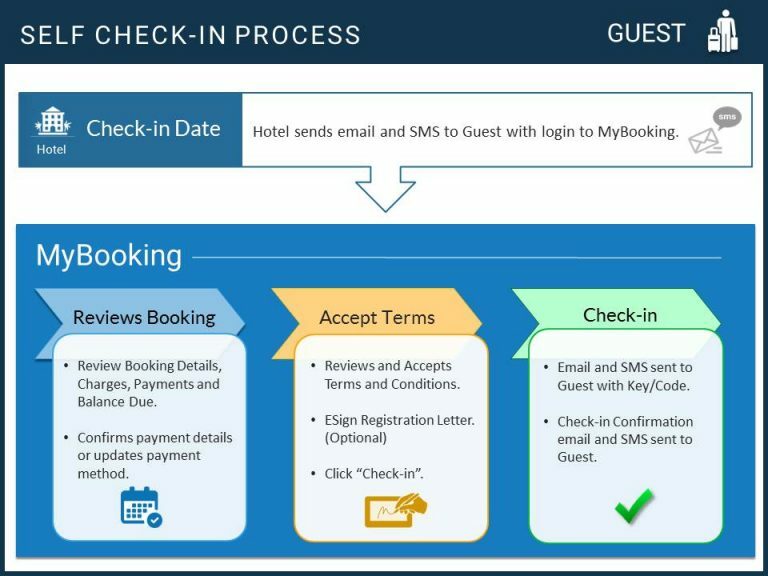 On Check-in date, the guest receives an Email and SMS with Self Check-in details and a secure access link to MyBooking, our secure guest access portal. Perfect for properties who use Self-CheckIn as a convenience or to supplement a ‘front desk’ environment. This system doesn’t print key cards, rather uses a field in the Room setting to offer either a code or directions to access the specific Room/Unit assigned. Assumes credit card payments are handled by Staff or check in occurs separate from e-payment (to keep the system outside hotel’s PCI scope). Perfect for properties who use Self-Check in as a supplement to the Front desk check-in process at a designated mobile check-in area. This approach uses an internet device to ‘greet’ guests at a location. The kiosk may include e-payment terminals, physical key printers for door access, and paper printers. Kiosk systems are designed for guests to look-up booking(s), ‘dip’ credit cards for authorizations, check-in, and print key cards or download app for low energy Bluetooth locks to gain room access. BookingCenter expects the customer to create their own ‘physical’ kiosk container, but does help with branding the UX and connecting all required technology. All software solution. MyPMS Integration. Unique access instructions per room, allowing detailed instructions for mix of hotel and rental units. Keyless doors recommended, ‘keyed doors’ with instructions; or a mix of both. Integration with MyGuests guarantees process oversight. Total automation allows for EMV ‘dipping’ to capture credit cards and Key Card delivery, supporting legacy doors. Dedicated infrastructure allows for self-managed guest experience with branded ‘look and feel’. Can replace Front Desk operations entirely. The tablet system assumes credit card payments are handled by Staff or check in occurs separate from e-payment (to keep the system outside hotel’s PCI scope). The tablet system doesn’t print key cards, rather uses a dynamic or fixed pass code system for electronic locks (sold and installed separately). When added to MyGuest , the Self Check-in process uses ‘push notifications’ to notify staff when guests Check In, as well as manage any error such as a Guaranteed By credit card declined, a room not assigned, cancellation, or Guest editing their details. Adding the SMS Module to Self Check-In delivers immediacy to your Guests. 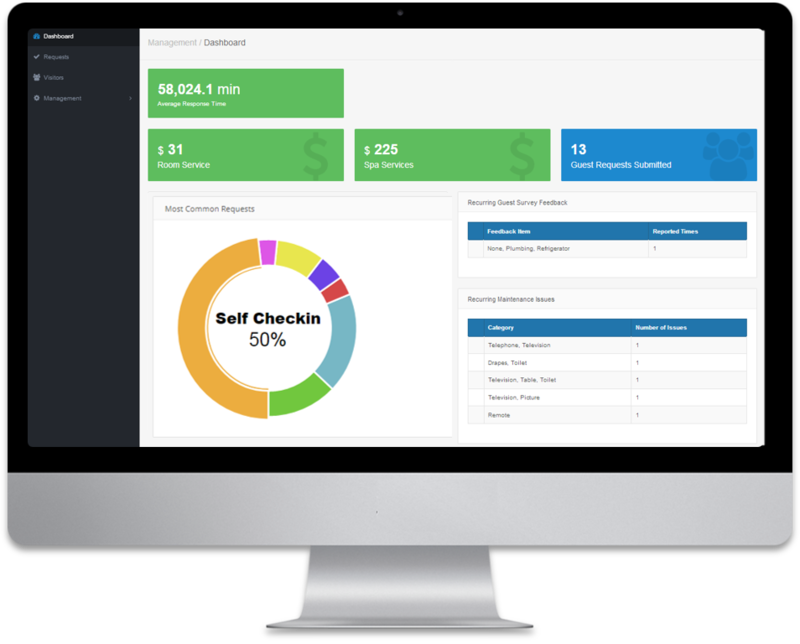 Self CheckIn comes with 24 x 7 Support and all Upgrades to the service. Let us help you choose the right Interfaces and Modules for your system. Contact us today!